When the farmhouse décor trend started to gain steam, it was clear that homeowners and designers were quite clever when it came to repurposing what was once thought of as old, cast-off pieces. Rusted metal signs, weathered wood furniture and found architectural pieces were given second chances as vintage home décor. One of those farmhouse design accents has gained a lot of popularity among homeowners—vintage corbels. These architectural pieces once served a practical purpose: they were weight-bearing (yet often pretty!) brackets that held up roofs, doorways, and ceilings. They can range from the stone creatures seen throughout Paris’ Notre Dame cathedral to simple, bygone farmhouses, used to accentuate and hold up porch roofs. Today, these architectural finds can be discovered at salvage yards, flea markets and even online marketplaces like Etsy and eBay. Many homeowners choose to leave them chippy and imperfect, adding even more character to their home décor. These homeowners and designers have gotten very creative with their corbels, just as Natalie Kolter of My Vintage Porch has done here—a collection of corbels looks especially chic! 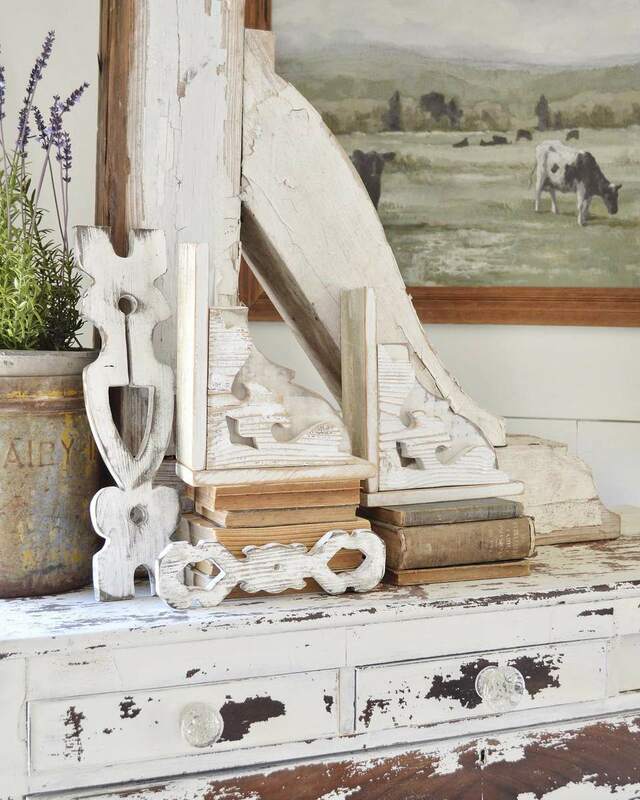 Here are 10 ways to weave vintage corbels into your home décor. If you’re looking to boost your shelfie game, look no further than distinctive, well-loved corbels. Here, Erin of @cottonstem has included them on her bookshelves, amid favorite reads and softly-green plants. On your shelves, bring in corbels in varying sizes, colors and designs to create even more visual interest. A corbel is a lovely addition to a vintage-inspired vignette, like the one that Sarah of @brickfarmhouse1919 has put together in the corner of her kitchen. Kitchen necessities, like a cutting board and scale, act as décor combined with a watering can, plants and of course, a gorgeous antique corbel. Sometimes, a doorway needs a little something to make it pop, and a corbel is a great way to add some extra interest. Jessica of @idreamofhomemaking has hung a simple corbel in this expansive doorway that otherwise may have looked as if it lacked something. It pairs nicely with nearby décor that includes wall art, plants and a wood chandelier in a similar hue. Many homeowners have gotten crafty and transformed corbels into working lamps and sconces. You can also purchase a ready-made corbel lamp—they’re often available through Etsy, Iron Accents and Houzz. Here, a corbel lamp is a sweet touch in this farmhouse bedroom, styled by Denym and Courtney of @doublethefarmhouse. It plays well with farmhouse accents, feminine linens and a “Good Morning, Gorgeous” sign. Instead of integrating them into your home décor, corbels can also work as décor that flawlessly stands on their own. If you’re all about the “less is more” approach to décor, corbels make a statement without overwhelming a space, perfected in this living room. Cher Schwein of @cherschwein used two side-by-side corbels as tabletop décor. Sometimes a workspace needs something special to make it yours truly, and that’s what Deborah of @bvintagestyle has done here. Starting with a concrete top poured by @completeconcreteltd, she brought in two corbels to hold it up and add vintage flair. It was the hint of whimsy this work area needed. Who knew that corbels work impeccably as bookends? That’s what Adrianne of @the_burg_nest discovered, using two of them to hold a few favorite books and double as tabletop décor. Liz Marie of Liz Marie Blog is a pro when it comes to corbels, featuring them prominently in inventive ways throughout her home. In her kitchen, she’s used vintage corbels to hold up her shelving, having them act as decorative brackets. They are a well-appointed design choice alongside shiplap, decorative touches, and vintage-inspired appliances. Are you searching for a new and different centerpiece to display at your next dinner party? Why not use a couple of corbels as your table’s focal point? That’s what Aly of @thedowntownaly did to spruce up her dinner table—delicate flowers, potted blooms on each place setting and two shabby-chic corbels. When a kitchen island needs a bit of vintage glamour, corbels are just the thing. Cindi of @cindimc.ivoryhome has installed a few antique corbels to bring eye-catching interest to her kitchen island, proving that if you have a random spot or corner of your home in mind, it’s likely that a versatile corbel or two will be the perfect finishing touch.